At Barrett-Jackson’s 2018 Northeast auction, a bright blue metallic 1980 Chevrolet Camaro Rally Sport coupe with black vinyl seats, a 3.8 liter/229 ci V6 with a two-barrel carburetor, an automatic, and 45,000 miles crossed the block. The hammer price was $4,700 for this honest, reasonably original car that no one ever tried to turn into something resembling a Z28. I find these non-top of the line cars interesting because they are rarely saved, leading to something like what we have with 1957 Chevrolets, where you’d think 90% of them were Bel Airs. 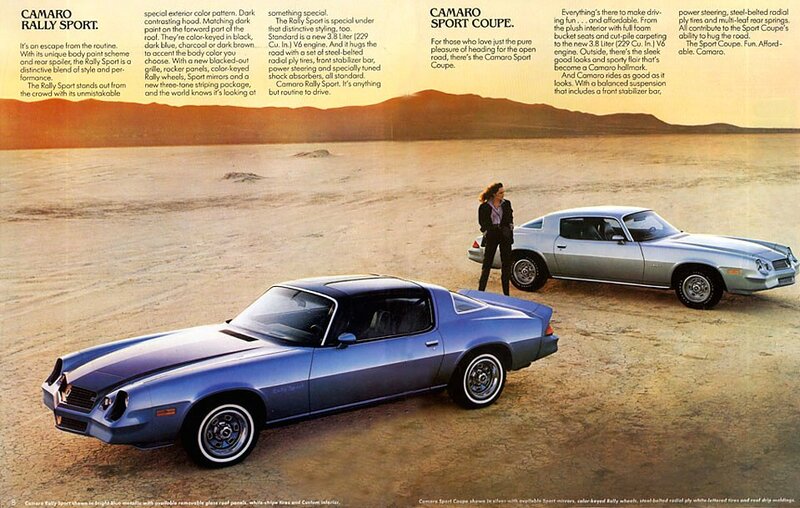 For 1980, Chevrolet featured four versions of the Camaro. The base model was the Sport Coupe, followed by the Rally Sport, the Berlinetta, and the Z28. This post is about the Rally Sport, which cost $5,916 (about $19,800 in today’s dollars) and got a few changes in the final year of this particular iteration. A new blacked out grille and a new three-tone striping package were visible, while inside sat a new standard V6. Rally Sport and Sport Coupe pages from the 1980 Chevrolet Camaro brochure, linked from the Old Car Manual Project’s amazing brochures pages. That new standard powertrain on the 1980 Rally Sport was the LC3 115 bhp 3.8 liter/229 ci V6 with a Rochester M2ME two-barrel carburetor paired with a three-speed manual. EPA fuel economy was 20 city/26 highway by the standards of the day—with a 20.9-gallon gas tank, a Camaro owner could expect to go 430 miles with a 10% fuel reserve. The trade-off was performance that belied the Camaro’s sporty looks: 0-60 in a little under 13 seconds with a top speed of 112 mph. Optional powertrains included two V8s, both of which required power brakes ($81): the L39 120 bhp 4.4 liter/267 ci with a two-barrel carburetor ($180) and the LG4 155 bhp 5.0 liter/305 ci with a four-barrel carburetor ($295). An automatic ($358) was available with all three engines, while a four-speed manual was only available with the larger of the two V8s. The LG4/four-speed combination yielded notably better performance than the base powertrain: 0-60 in about 10 seconds. It didn’t make mileage that much worse—16 city/24 highway by 1980 standards. Standard exterior and mechanical equipment on all Rally Sports included High Energy ignition, power steering, front stabilizer bar, sport mirrors, rear spoiler, concealed windshield wipers, front disc/rear drum brakes, and 205/75R14 steel-belted radial ply tires (a size still available thanks to Hancook and Kumho) on 14-inch color-keyed Rally wheels. Inside, flow-through ventilation system, contoured full-foam vinyl bucket seats, a “centre” (as spelled in the brochure) floor console, and cut-pile colour-keyed carpeting were included. Exterior and mechanical options included removable glass panels ($695) and 14 x 7 aluminum wheels ($337). Inside, air conditioning ($566), intermittent windshield wiper system ($41), electric rear window defogger ($107), automatic speed control ($112), power door locks ($93), power windows ($143), a Custom interior ($68), gauge package with tachometer ($120), Comfortilt steering wheel ($81), and an AM/FM stereo radio with stereo cassette tape ($272) were all available. 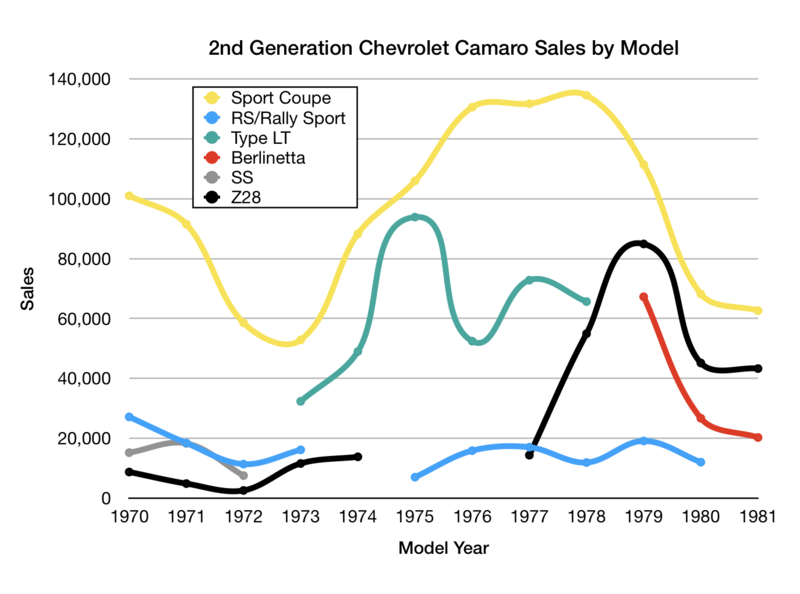 Though the Z28 wasn’t the most popular Camaro, the Rally Sport did not hold up its end of the bargain (likely why it was gone in 1981). The leading seller remained the entry-level Sport Coupe (46% of production), followed by the Z28 (30%), the Berlinetta (16%), and the Rally Sport (8%). According to Hagerty’s valuation tools, all the money for a 1980 Camaro Rally Sport with the LG4 V8, a four-speed, and T-tops in #1/Concours condition is an astounding $21,600, with a far more typical #3/Good car with same equipment going for $12,800. Values slide down substantially with the base equipment—a base V6 Rally Sport in #3 condition is only worth $7,600. This generation of the Rally Sport maintains some presence in the Hemming’s Motor News classifieds and on eBay Motors—as I write this in August 2018, there’s a beige/metallic brown 1979 with 78,000 miles for sale asking $29,000. Make mine bright blue metallic, please.